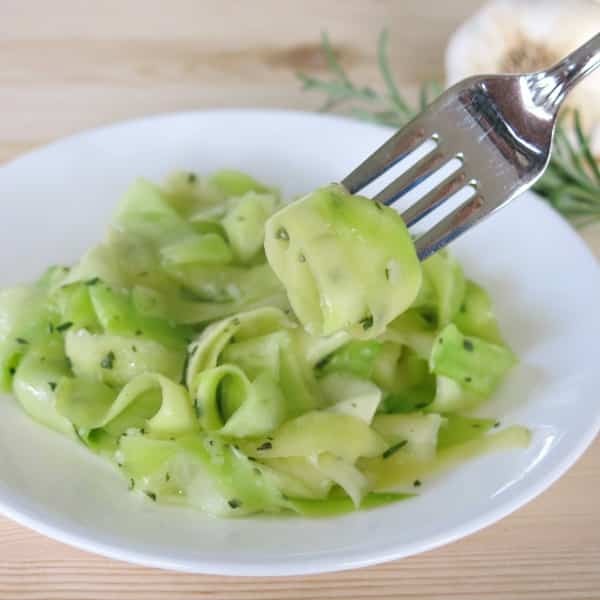 Zucchini Ribbons Sauteed in Garlic and Rosemary are ready in 20 minutes and don’t require any fancy equipment either! Make them with a vegetable peeler. They’re a perfect low-carb, gluten-free side dish. For some reason, zucchini takes on a whole new taste when served in an unexpected way, at least at our house. 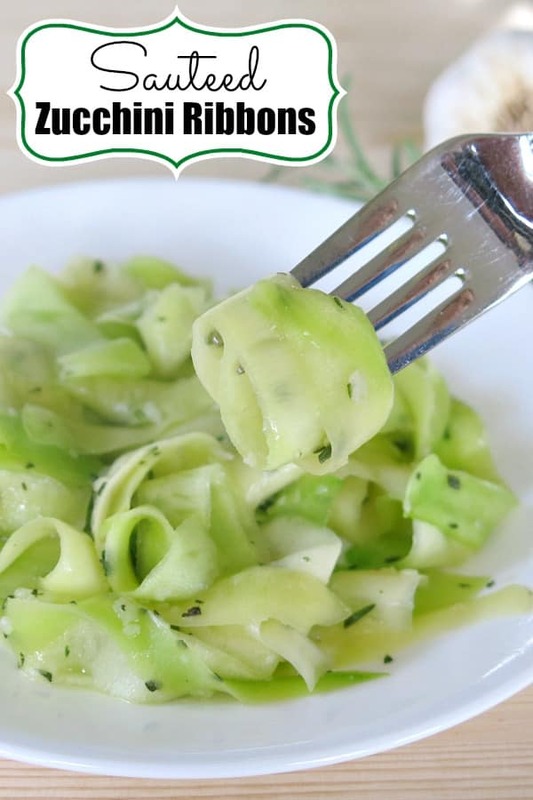 We spiralize it to make Zucchini Noodle Alfredo and slice it thin to make Zucchini Chips. Both of these are a hit. It’s the same experience with zucchini ribbon pasta. Thin strips of zucchini are smooth and silky, just like noodles. After they are sauteed in a little olive oil, garlic and rosemary, you might second guess whether you’re in fact eating a new fangled pasta! Really…doesn’t this plate of zucchini ribbons look a bit like spinach flavored pasta? 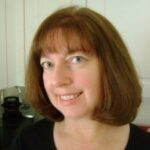 And, no…I did not put on my sneaky mom hat and try to pass them off as such. I didn’t have to. They looked so appetizing and the aroma was enticing, they got two thumbs up before they hit the table. Another nice thing about this side dish is that it only takes about 15 minutes from start to finish to make. You could probably do it in 10 minutes if you’re organized. Peel off the outer skin of the zucchini with a vegetable peeler and discard. Continue peeling the rest of the zucchini into long strips. When you get down to the seeds, you can decide whether to keep going. If you don’t like the look of seeds, then you might just want to stop peeling at that point. I started with a little over a pound of zucchini. By the way, we used a vegetable peeler to make shaved broccoli noodles too. A spiralizer is an option in both of these recipes, but definitely not a requirement to make this tasty dish. Add olive oil to a large pan and heat over medium high heat. Next, add minced garlic and rosemary to the pan and soften for a few minutes. Finally, add zucchini ribbons to the pan. I can fit about a pound of zucchini into my pan at one time. Saute the zucchini for about 5 minutes. Sprinkle with a little salt, if desired. Fresh rosemary is totally worth it. 🙂 If using dried rosemary, then use about a 1/3 less. 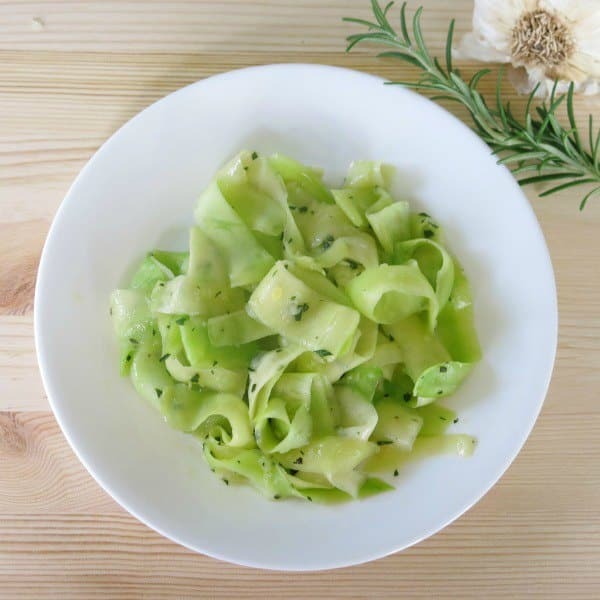 Recipe Variations: Use the basic process to make zucchini ribbon pasta and saute with just olive oil and garlic. Or, try adding other herbs, like thyme, oregano or basil. Zucchini ribbons are a great side dish with just about any entree. Please rate this recipe and tag @DinnerMom or #DinnerMom if you make it. We love to see what you are cooking up. Zucchini ribbons sauteed in garlic and rosemary are a fun and tasty side dish. And quick too, ready in about 15 minutes start to finish! 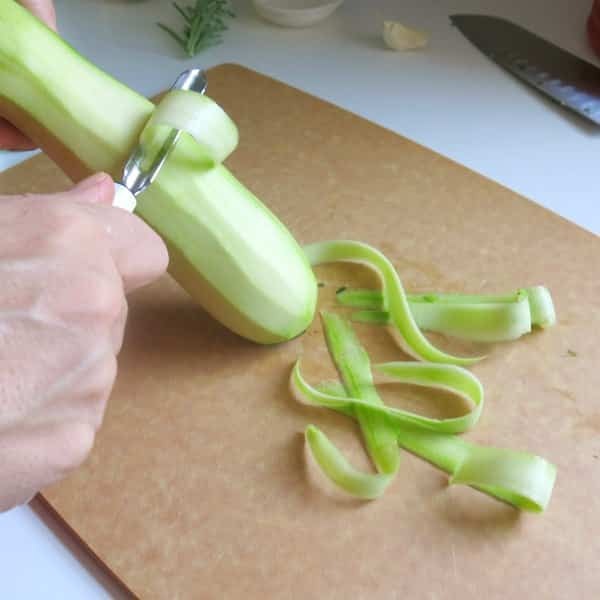 Using a vegetable peeler, remove the outer skin from the zucchini and discard. Continue to peel the zucchini into long strips or "ribbons." Add olive oil to a large pan and heat over medium high heat. Add garlic and rosemary to pan and soften for about 2 minutes. Add zucchini ribbons to the pan and cook for about 5 minutes, stirring frequently. Remove zucchini from pan and season with salt, if desired. Enjoy! I’ve made zucchini ribbons before but I’ve always paired them with a pasta sauce and used them as a substitute pasta. This dish looks great. Sounds like a delicious alternative to pasta! I totally agree! We gobbled these down. Can’t wait to try for my 10th month old. Most recipes call for olive oil. Have you tried organic coconut oil? I’ve started using that a lot more often than OO for both a nutritional boast and soft taste (and I don’t like coconuts). Plus it has a higher heat tolerance, Whatever the proper word is… I even put it in water when steaming veggies or making soup. Ah, I’m getting hungry. Thanks for the recipe! Thanks so much for your comment! I have started using coconut oil and I need to try it on this one! I am so in love with this recipe! I make zoodles all the time as well as zucchini bread and this is such a great way to change it up. I’ve also got some fresh herbs growing inside which will make this combo with the garlic taste awesome. Thanks for the fantastic idea! Thanks for your comment! So glad you like it. This is such an easy and healthy recipe! Love the garlic and rosemary in this perfect summer dish! Thanks Amanda! Rosemary grows so easily, I find that I add to recipes all the time!